In case you missed this little tidbit on T: The New York Times Style Magazine yesterday, men’s fashion director Bruce Pask shared some highlights of the TOM FORD Fall/Winter 2012 Menswear Presentation in Milan. As for his favorite look? 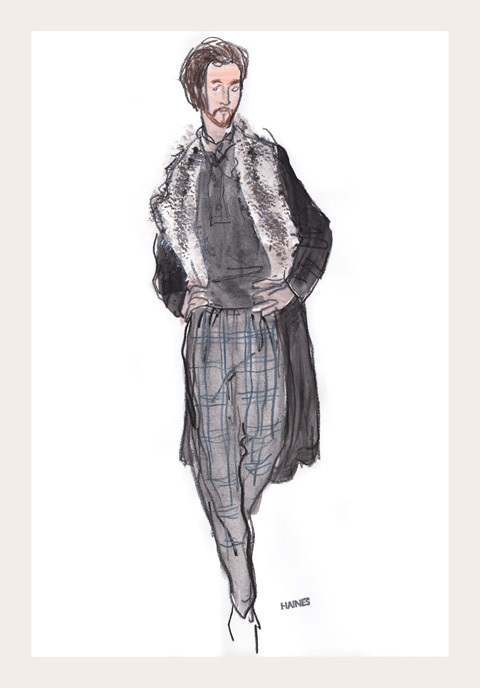 That coat… oh, that coat looks divine, even as an illustration! That illustration is fantastic and really I’m starting to wonder why I don’t pay more attention to his menswear designs (I mean, obviously I know his suits, but there’s more to menswear than that!). I’d love to consider whether his menswear designs have an echoes in his womenswear collections, you know? Plus I’m all about seeing how menswear can be unique and that look screams unique. I love the illustration! It’s fantastic. I definitely have to agree with Casee!! Nice sketch you got there huh, it’s nice and I like it… I agree with Casee.